Grave stone of Mary Palmer Sparks in Village Creek Cemetery, Connersville Township, Fayette County, Iowa. Mary was born in South Carolina in 1779 and was the daughter of Rev. Joshua Palmer. She married William Sparks about 1796. They moved to Union County, Indiana about 1808 and to Fayette County, Indiana a few years later. Mary died in 1848 and her husband in 1862. They had 10 children. Grave stone of Fannie Stiles, wife of Joshua Palmer, son of Rev. Joshua Palmer. Fannie was born in South Carolina in 1786. She and Joshua were married in Laurens County, South Carolina in 1802 and were the parents of 12 children. They moved to Union County, Indiana about 1808, and were the founders of the Silver Creek Church in 1816. They lived in Johnson, Shelby, Bartholomew, and Owen counties, Indiana. Joshua died in the late 1840s in Indiana. Fanny moved with two of her sons to Sullivan County, Missouri, where she died in 1861. She is buried in the Schrock Cemetery in Taylor Township. Grave marker of Eda Elizabeth Palmer and her second husband, Jacob Rust, in Oak Lawn Cemetery, Oakland, Iowa. Eda was the oldest child of William Palmer and his wife, Jane Gill, and a granddaughter of Rev. Joshua Palmer. Eda was born in South Carolina in 1805 and as a child traveled with her family to Indiana. There she married her first husband, Perry Morris. They moved to Illinois about 1828. Perry died in 1838 and Eda remarried to Jacob Rust in 1842. They moved to Pottawattamie County, Iowa in the 1850s. Jacob died in 1887 and Eda in 1897. Stephen Sumner Rust was the son of Eda Elizabeth Palmer and her second husband, Jacob Rust. He was born in Henderson County, Illinois in 1848 and as a child came to Oakland, Iowa with his parents. He married Mary Ann Strong in 1865. He was a farmer, grain dealer, banker, and rancher. Stephen owned a business block in Oakland and large land holdings in Nebraska and Colorado. He served as treasurer and councilman of Oakland. He died in 1913 and his wife in 1920. They are buried in Oak Lawn Cemetery, Oakland, Iowa. Grave marker of Mary Ann "Polly" Palmer in Oak Lawn Cemetery, Oakland, Iowa. Mary was the second child of William Palmer and his wife, Jane Gill. She was born in South Carolina in 1808 and as a baby traveled with her family to Indiana and later to Illinois. She married her first husband, William Cousland, in 1829. He died in Oquawka, Illinois in 1846 and in 1850 she remarried to Levi Wilkinson. Mary died in 1861. In 1863, Levi died of smallpox at Nashville, Tennesse while serving in the Union Army. He is buried there. Benjamin Palmer was born in Union County, Indiana in 1814. He was the oldest son of William and Jane Gill Palmer. As a boy he moved with his family to Illinois, where he served in the Black Hawk War. He married Albina M. White in 1836. They lived in Henderson and Rock Island counties in Illinois and in 1852 moved to Council Bluffs, Iowa. A few years later they moved to Oakland, Pottawattamie County, Iowa and lived in that vicinity until Benjamin died in 1881. He is buried in Oak Lawn Cemetery at Oakland. Albina M. White was born in Roane County, Tennessee in 1820. As a child she moved with her family to Indiana and then Illinois, where she married Benjamin Palmer in 1836. After he died in 1881, she moved to Woodbury County, Iowa, where she died in 1906. She is buried in Bethel Cemetery, Peiro, Woodbury County, Iowa. Daniel Palmer, son of Benjamin and Albina (White) Palmer, was born at Oquawka, Henderson County, Illinois in 1839. He moved with his family to Pottawattamie County, Iowa in 1852 and married Sophia Morris there in 1859. They were the parents of 11 children. Sophia passed away in 1880 and Daniel remarried to Sarah (Dill) Morris in 1883. Daniel died in 1928 and is buried next to Sophia in Oak Lawn Cemetery, Oakland, Pottawattamie County, Iowa. William Palmer, son of Benjamin and Albina (White) Palmer, was born in Illinois in 1841. He came to Pottawattamie County, Iowa in 1852 and married Cora Sinclair there in 1865. They were the parents of 15 children, 14 of whom lived to adulthood. 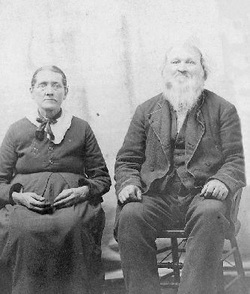 William and Cora lived in Pottawattamie and Woodbury counties in Iowa and in Clark County, South Dakota. In 1907 they moved to Black Butte, Bowman County, North Dakota, where William died in 1910. He is buried on their homestead. Cora died in Watertown, Codington County, South Dakota in 1939 and is buried there. 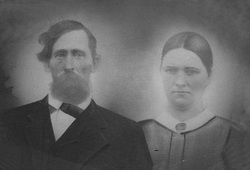 John C. Palmer, son of Benjamin and Albina (White) Palmer, was born in Illinois about 1844. He was deaf from a childhood illness. At the age of eight he came with his family to Pottawattamie County, Iowa, where he was married three times: to Calista Chase in 1870, to Lena Hallenbeck in 1875, and to Emily (Pierce) Mikesell in 1877. John died 27 December 1897 at Atlantic, Cass County, Iowa. 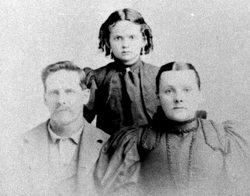 Martha Palmer, daughter of Benjamin and Albina (White) Palmer, was born in Illinois in 1846 and came to Pottawattamie County, Iowa at the age of six. In 1871 she married William Malcom, brother of Duncan D. Malcom who married her sister Eliza Palmer. William died before 1880 and in 1882 Martha moved to Woodbury County, Iowa. She married Addison F. Brown in 1884. Martha died at Oto, Woodbury County, Iowa in 1910 and is buried at Bethel Cemetery, Peiro, Iowa. She was the mother of six children, but only two, Alva C. Davis and John Malcom, lived to adulthood. In this photograph, she is holding John. Eliza Albina Palmer was born in Council Bluffs, Pottawattamie County, Iowa in 1853. She married Duncan D. Malcom near Avoca, Iowa in 1872. He was a brother of William Malcom who married Eliza's sister, Martha. Duncan and Eliza had 11 children. In 1882 they moved to Woodbury County, Iowa, where Duncan died in 1929 and Eliza in 1944. They are buried at Bethel Cemetery, Peiro, Iowa. Joshua Palmer, son of Benjamin and Albina (White) Palmer, was born in Pottawattamie County, Iowa in 1856. He married Amanda Bunnell there in 1881 and they had 11 children. 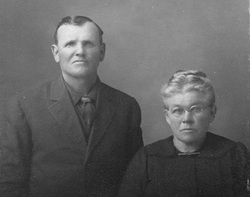 They lived in Adair, Adams, and Madison counties in Iowa before moving to Parker, Turner County, South Dakota in 1917. Amanda died there in 1920 and Joshua passed away near Creston, Union County, Iowa in 1934. They are buried at Parker, South Dakota. Ephraim Palmer, youngest son of Benjamin and Albina (White) Palmer, was born in Pottawattamie County, Iowa in 1858. There he married Eliza Starts and they became the parents of five children. They lived in Woodbury County, Iowa before moving to Artesian, Sanborn County, South Dakota in 1911. Eliza passed away at Artesian in 1928 and Ephraim died near Wheeler Grove, Pottawattamie County, in 1939. They are buried at Wheeler Grove. Ephraim conducted his church's choir, taught singing school, and frequently sang on radio program in Shenandoah, Iowa. 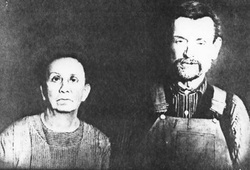 Margaret Palmer, pictured here with her husband, Thomas Johnson, and daughter, Leona, was the youngest daughter of Benjamin and Albina (White) Palmer. She was born in Pottawattamie County, Iowa in 1860 and was married there in 1875. The Johnsons lived in Woodbury County, Iowa several years before moving to Hartington, Cedar County, Nebraska. Thomas died there in 1919 and Margaret in 1939. They are buried at Hartington. They were the parents of nine children. Grave marker of Susan Palmer in Oak Lawn Cemetery, Oakland, Iowa. She was the daughter of William and Jane Gill Palmer. Susan was born in Indiana about 1817. As a child she moved with her family to Illinois and was married to Lewis Huff in 1830. They lived in Henderson and Rock Island counties in Illinois before moving to Council Bluffs, Iowa about 1852. After a few years there they moved to Oakland, Iowa and spent the rest of their lives there. Susan died in 1874 and Lewis in 1885. They had 12 children. Sarah Caroline Palmer was born in Indiana in 1819, the daughter of William and Jane Gill Palmer. As a child she moved to Illinois with her parents and was married to Gearshom Vanatta in 1833.They lived in Henderson, Rock Island, and Mercer counties in Illinois until 1854, when they traveled the Oregon Trail to a new home in the Northwest. They settled first in Linn County, Oregon but a few years later moved to Clark County, Washington. They are buried in the cemetery at Brush Prairie, Washington. Gearshom died in 1896 and Sarah in 1901. Minor Thomas Palmer, youngest son of William and Jane Gill Palmer, was born in Fayette County, Indiana in 1822. He moved with his parents to Illinois when he was a child. He was married to Caroline Tuel in 1848 in Rock Island County. In 1852 they moved to Council Bluffs, Iowa and about 1855 to Oakland, Iowa. They had 10 children. Minor was a physician and kept a store and post office at the now-vanished town of Parma. He died in 1882 and Caroline died in 1890. They are buried at Oak Lawn Cemetery in Oakland, Iowa. 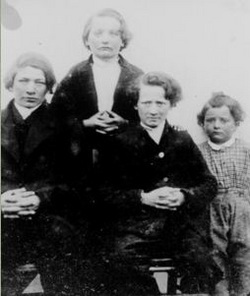 Four sons of Minor and Caroline (Tuel) Palmer are shown in this picture taken about 1864. From left they are Marion, Sumner, George, and Abraham. Marion (1851-1927) was married to Susanna Davis and after her death to Lizzie Jane Scott. 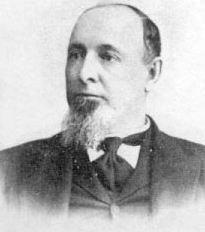 Sumner (1853-1939) married Cyrena Adella Thomas. George was born in 1855 and died in 1876. Abraham (1861-1941) married Rose Barton. The three oldest sons lived in Pottawattamie County, but Abraham moved to Los Angeles and died there.